First come ads, then come books? 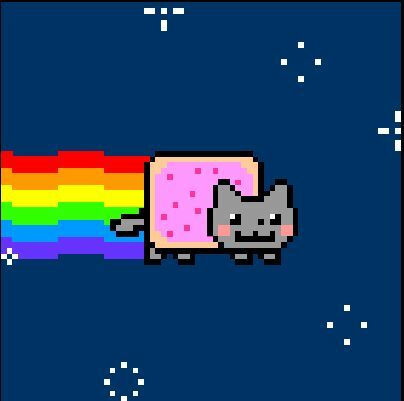 Have you heard about the latest viral video phenomenon, Nyan Cat? If you haven’t, then you are not one of the 40 million people that have downloaded the video of a poptart cat who flies through space leaving behind a rainbow trail while a most annoying song plays in the background. But that got me thinking about using viral videos for book marketing campaigns. The ABC series Castle has done something similar – they created a character, the show was a success, and now they have several books out in the real world that have been penned by Richard Castle. And they are best sellers! But, alas, we are not ABC. But we do have Movie Maker software at our disposal and we can create “book trailers.” And if our trailer is clever enough, funny enough, suspenseful enough, then maybe it can go viral as well. I mean, when was the last time you saw a movie trailer and you had to go see that movie based upon that trailer? Mark Fadden is a freelance writer and author whose latest, award-winning suspense thriller, The Brink, is now available as an eBook for Amazon.com Kindle and Barnes & Noble nook for only $2.99! Sept 17, 2010 – Colleyville, Texas – The Internet has changed almost every facet of the way we do business. For authors, the Internet is a powerful tool to reach readers, but few understand how to fully utilize it to maximize their marketing dollars. Fortunately, Colleyville author Mark Fadden is hoping to educate other authors on how to use the Internet, and more specifically social media, to sell books. “Never forget that writing is a business,” was Fadden’s central message of his Get Your Book Read! lecture last night at the Little Elm Public Library in Little Elm, Texas. 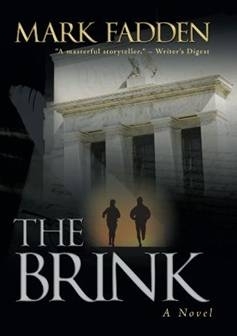 Fadden’s latest thriller, entitled The Brink, which was recently published in May 2010, uses the current financial crisis as the foundation of a fast-paced suspense thriller in which a fugitive Texas Ranger helps a woman running for her life, only to get sucked into a secret society’s plot for global financial Armageddon. The book was awarded both the Editor’s Choice Award and the Rising Star Award from its publisher and Fadden had the most successful signing of the year at the Colleyville Borders bookstore. “As writers, we wear the artist hat. We use our creativity to do our job. But, if you want anyone besides your mother to read the book, you must take off the artist’s hat and put on the entrepreneur’s hat. You’ve got to think of creative ways to sell books.” For Fadden, that includes everything from talking directly to area book clubs and showing up at their meetings when they review his books, to being a part of cooking classes like “Pots & Plots” at the Colleyville Market Street grocery store. Students in the class cook a meal from the books they read and then talk about the book as they eat. The Brink is Fadden’s third novel. His first novel, Five Days in Dallas, was published in 2003. It received critical acclaim and Fadden himself was even called a “masterful storyteller” by a Writer’s Digest reviewer. Fadden has several book signings and lectures scheduled in the next few months. 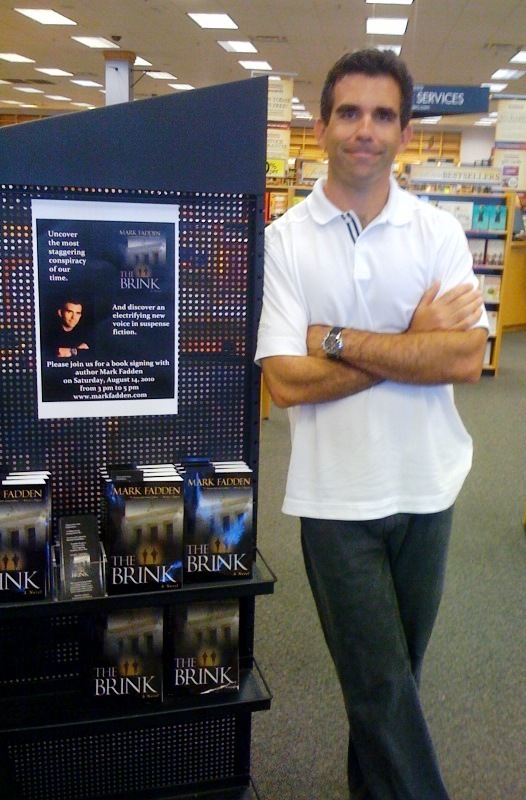 His event schedule and the first 22 pages of The Brink can be previewed at www.markfadden.com. Email him at mark@markfadden.com to get a copy of his Get Your Book Read! PowerPoint presentation. Fadden has also created a blog about writing novels and book marketing using social media entitled, “The Nightstand Diaries,” which can be read at www.markfadden.wordpress.com. The Nightstand Diaries – 1 year, 5,000 books, and an (almost) anything goes approach to marketing a political thriller. FB ad round-up – is it getting ‘chilling’ up in here? 104 clicks over 3 days isn’t bad. I just wish I knew if those folks bought books. Along those lines, I’m going to contact outside help to see if I can track down that info. More on that in tomorrow’s post. The lovely and talented ladies from girlsinthestacks.com informed me today that the podcast is really a video interview. So I’m off to take the hedge clippers to my eyebrows in a bit. To get ready for the interview, I sent them a few suggestions of the topics we could cover. (As a freelance reporter, I find it very nice when your subject does this) I also spent some time doing research online about those topics. So, tonight’s homework is to learn how to embed a video into tomorrow’s blog. Last night, we talked about how you can incorporate podcasts into your blog or site to get book sales. Well, videos are an even better way to do that. On my site, I have a book trailer on the home page that starts automatically. While it’s pretty basic, the music is really cool, very ominous and gets people in that thriller mindset. Try to make a list of 5 uses for videos to sell your books. Then expand that to 10. It’ll be easier than you think. Then all you need is a 17 year old to tell you how to edit and embed the thing into your blog and website and you’re good to go!